A poker run is sometimes just for motorcyclists, but the #DCPokerRun is open to all. You’ll spend the day visiting locations in Washington D.C. at your own pace. If you do ride, you are encouraged (but not required) to wear your combat boots as a symbol of solidarity and respect for the struggles of those veterans who fell by suicide. The day will start as early as you want it to. There is no penalty for sleeping in. However, at 7 am, a group of veterans will be leading an early morning run / bike / walk PT session at Iwo Jima, starting with 22 push ups to remind us of the 22 veterans who we will lose on that day. At 10am, the Poker Run will stage and the National Anthem will be sung at the Iwo Jima Marine Corps War Memorial to kick off the day and we will distribute maps of the five locations where we will go to memorialize Veterans lost to suicide and raise awareness of the issue. The last stop on your tour will be Arlington Rooftop Bar & Grill in the early evening. 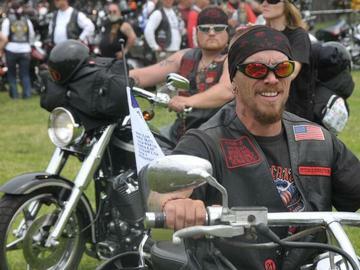 Please arrive before 6 p.m. Motorcycles park for free on N. Adams St., thanks to the Navy League of the United States. This is where you’ll receive a playing card for each location you visited. You will receive a unique token at each location and will receive your full hand when you arrive at the Arlington Rooftop Bar & Grill. You must arrive at the Arlington Rooftop Bar & Grill by 6pm for your hand to count. If you miss the staging in the morning, don't worry! You've got all day! Start the ride from your house. The only requirement is that you check in at the stops you do visit and complete the run by 6pm at the Arlington Rooftop Bar & Grill. You do not need a motorcycle to participate and you do not have to drive anywhere to participate if you buy individual cards at the venue. You can also buy individual cards to fill in your hand with stops you may have missed. Play more than one hand for better chances of winning! At 7pm the winner will be announced and the person with the best hand will receive the grand prize! 10 DAYS STAY AT THE ALA MOANA HOTEL IN WAIKIKI!!! Enjoy more raffles and live music throughout the rest of the evening by the Springfield Station Band, McKayla Reece, Tommy Fields and Nikki Boyer as The Cardboard Cutouts, followed by a DJ until close. With your help we can build hope and put an end to veteran homelessness in the Washington D.C. area and beyond.